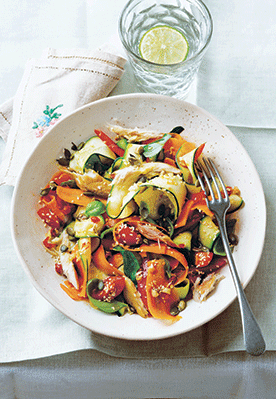 The mackerel in this vibrant salad is a wonderful source of vitamin D, protein and B vitamins. It’s also a rich source of omega-3 fatty acids, a type of fat which is amazing for your health. The dressing really brings the flavour of this bowl together, as well as adding a little luxury and piquancy to your spring vegetables. 1. Top, tail and peel the carrot. Peel it into wide ribbons with a vegetable peeler (or use a mandolin if you have one), and do the same to the courgette. Quarter the cherry tomatoes and finely slice the basil leaves. Cut the red pepper into thin strips. 2. Put everything in a large mixing bowl and crumble in the mackerel fillet. Add the seeds and mix with salad servers. 3. To make the dressing, combine all the remaining ingredients in a small jug and mix well. Pour this all over your salad and toss to coat everything in the dressing. Recipe taken from Bowl Food (£14.99, Ryland Peters & Small). Bowl Food will be available to Your Healthy Living readers for the special price of £10.99 including postage & packaging (RRP£14.99 by telephoning Macmillan Direct on 01256 302 699 and quoting the reference LA4).